Despite my complaints, I really did enjoy the actual reveal that Baz released Cyborg Superman instead of Clark. I loved that Jurgens was channeling a horror movie, from the narrow hallway to Cyborg Superman distorting his face in Baz’s, and even the use of shadows to hide his appearance is pretty damn great. I would argue that if Hank Henshaw wasn’t teased at the end of the previous issue, then him blasting Simon through the Fortress of Solitude would have made a bigger impact. Most of the credit to this sequence should go to Marco’s Santucci’s pencils, but the giving that the scene originates from Jurgen’s I’ll give the credit where credit is due Even though Henshaw’s diatribe is completely cliche, you can’t Jurgen’s still writes a terrifying Cyborg Superman. After he did create the character, so it’s nice to see that even after twenty five years Jurgen’s can still write make this dated character not seem that dated after all. My feelings on how the plot progression has been handled, one of the better aspects to come out of this run has been Marco Santucci on pencils. I love the aesthetic he establishes for this scene, the hollowing wind and snow, the ever prevailing darkness make for a great scene for a villain to explain his plan. While I didn’t even cover the first half of comic (because most of it is regurgitating the idea that Simon is a traitor) Santucci’s double page splash of the Green Lanterns releasing penelo’s people into their new home is outright gorgeous. Not only for it’s sense of scale but how crisp and clean Hal looks along with his constructs. While this arc is clearly filler before Grant Morrison takes over in November, I hope someone at DC is paying attention to this man’s pencils. Great storytelling with consistent anatomy, and he has can draw incredible detail, this is a artist that people should not be sleeping on. 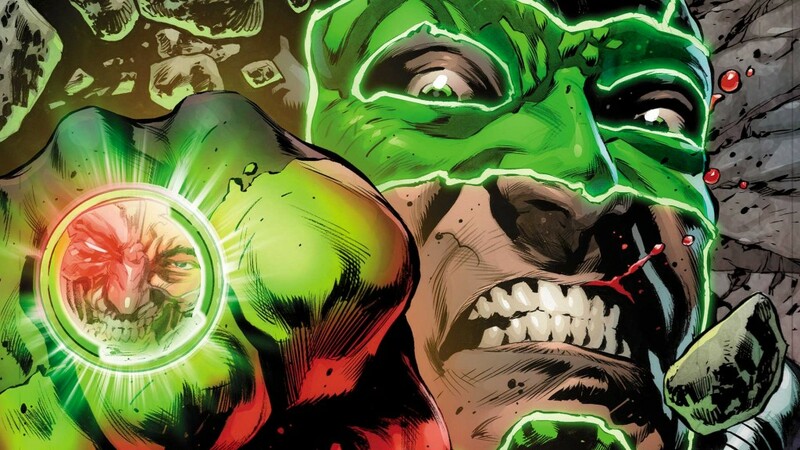 I’m not a fan of what is happening in Green Lanterns. This isn’t the book that I loved anymore, it’s not even the dramatic tone shift that bothers much. It’s the lack of cohesion that disturbs me, I don’t feel connected to the characters nor do I the plot. I feel like I’m just going through the motions with these final issues, biding my time until Grant Morrison takes over.